New Forest Ponies were named after a region in southern England, New Forest. Their exact origin is unknown but ponies have lived in the area for many centuries. During the 18th century the Thoroughbred stallion Marske, father of the famous race horse Eclipse, served New Forest mares. 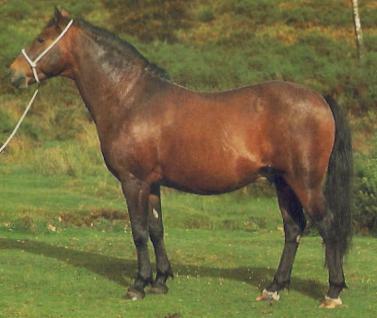 In the mid-19th century one of Queen Victoria's Arabian stallions was allowed to run with the New Forest herd. Hackney blood was also introduced. The cross breeding added to the pony's size but was harmful to the true pony element. In order to correct the situation stallions of other native breeds including Dales, Dartmoor, Exmoor, Fell, Highland, and Welsh Mountain ponies were crossed with the New Forest. The result was a tough, sure footed pony, with a free, straight action and a pleasant temperament, well adapted to the harsh environment. Many New Forests are still running free in their native country where they survive on meager, low quality food supply. In England the New Forest Commoners have an annual round-up of their herd to select ponies to be sold with the remaining stock returned to the forest. In 1891 the Society for the Improvement of New Forest Ponies was founded. The first studbook was published in 1910 by the Burley and District New Forest Pony and Cattle Breeding Society. Since 1960 the New Forest Pony Breeding and Cattle Society has published the studbook. New Forest Ponies are also popular in Europe, North America, Australia, and New Zealand.